A lot of cars already resemble mobile entertainment systems, with TV screens and video games to keep everyone except -- hopefully -- the driver occupied. But they'll get even smarter (and probably more chaotic) if this year's International CES is anything to go by. Qualcomm announced Monday that it has developed a version of its Snapdragon processor, widely used in smartphones and tablets, for in-car "infotainment" systems. Like other vendors here, Qualcomm sees an opportunity to bring more computing to automobiles, both to entertain passengers and to interact with the surrounding environment to improve road safety. It sees cars running multiple operating systems and sophisticated applications, with services such as gesture and voice control to help drivers keep their hands on the wheel, and multiple HD displays, 3D gaming and streamed Internet content for the rest of us. Whether Qualcomm is also developing a cure for car sickness in its labs is unknown, but it's certainly taking care of the computing part. It will be up to consumers to decide if they want to get on board. 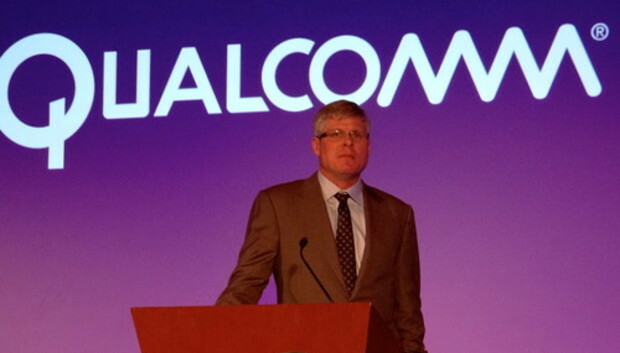 Qualcomm already provides LTE and other communications technologies for connecting systems such as OnStar to the outside world. It's less strong in applications processors for cars, where it will have to battle rivals including Intel and Nvidia, but it thinks it can parlay its strong in-car LTE presence into more general vehicle chips. "Right now we're in a phase where the car itself is trying to get connected. The next phase is that the car will get connected to other cars, and it's going to do a lot more sensing of what's going on in its environment and making decisions about what it's going to do," newly appointed CEO Steve Mollenkopf told reporters at Qualcomm's press conference in Las Vegas. To do that, and to serve up games and video, it will need a more powerful CPU. Qualcomm's new chipset is the Snapdragon 602A, which includes its quad-core Krait CPU, Adreno 320 GPU, Hexagon DSP, integrated baseband processing and additional audio, video and communication cores. The chipset has also been pre-integrated with other Qualcomm silicon for 3G/4G-LTE, dual-band 802.11ac Wi-Fi and Bluetooth LE 4.0, to provide "unprecedented, integrated connectivity options for connected infotainment systems," Qualcomm said. Nvidia also has big plans for its chips in cars. On Sunday night, it introduced its new Tegra K1 GPU, and the uses it has in mind include driver assistance applications that tell a person when they're drifting out of their lane. Eventually, it's eyeing self-driving cars.